Pictured below is a 75/2 "Gauss-Tachar Astro Berlin" rangefinder coupled Leica Screw mount lens. While Astro-Berlin is a well known manufacturer of quality telephotos, Astro RF coupled lenses for Leica seem to be relatively unknown, even amongst Leica experts. Any information on this pre-war lens, and other RF coupled Astro-Berlin lenses, would be greatly appreciated. I contacted Marc Small, the author of the excellent new book "Non-Leitz Leica Thread Mount Lenses" published by Wittig. This lens was new to him too. According to Randal Hooper, noted Leica expert, this is a converted Cine lens. If so, whoever did the conversion did a remarkable job. Lens Characteristics: The lens is marked in meters, the closest marked focusing distance is 1.25 meters. 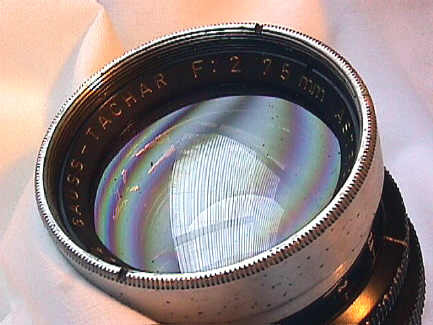 The lens is uncoated and marked in standard F/stops between 2 to 22. Serial # is 35524. I bought this lens from the original owner, who bought it before the war in Germany. It has it's own screw in hood. Weight is 11 oz. Filter size 44mm. Length from front to rear of mounting flange, 3 3/32" or 78mm (infinity position). Width at widest point 2 1/8" or 54mm. Most of the lens barrel seems to be of aluminum. Parts of the barrel, and the lens shade, seem to be hand painted. It's my guess this lens was either a prototype, or a very limited production item made for evaluation. However, a 1937 Astro-Berlin catalog has been found offering special order "Leica Mount lenses. 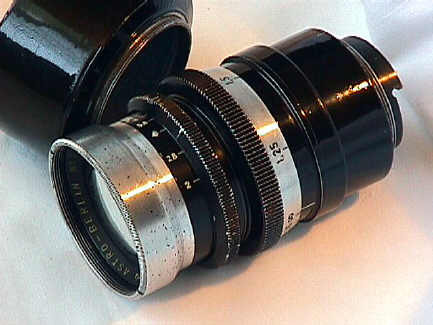 Postwar, Astro-Berlin lenses were first listed in the US by Sterlng Howard in 1951. The first imported was the 400/5 in Exakta, Contax S, and reflex housing lenses for Leica RF and Contax RF. By 1952, they listed for "Eyemo, Mitchell, Arriflex and similar mounts" a 25/2, 32/2, 40/2, 50/2, 75/2, 100/2, all Gauss-Tachars which were described as "Super Speed high-contrast lens with high color correction, for 8, 16, 35 and 70mm cine cameras." Also listed were the 300/5 and 400/5. By 1954 the importer was changed to the Ercona Camera Corporation, and the imported lineup was expanded. Astro Pantachars were added in 125/2.3, 150/2.3, and 150/1.8 focal lengths. These were available in Contax S (now called Pentax screw), Exakta, Primar Reflex, Master Reflex, Hasselblad, and 16-35mm cine cameras. In the longer Astro Fernbild line, 300/3.5, 500/5, 640/5, 800/5, and 1000/6.3 lenses were added, none of them mirror lenses! The 1000/6.3 must have been a monster! Note that Astro specialized in high speed lenses. For a while it seems Astro lenses were not imported into the US, but I found another reference to them being imported as late as 1978, again by Ercona Corporation. At that time the line up was a the 125/2.3 Astro-Tachar, 150/2.3 Astro-Tachar, 150/2 Color-Astra, 150/1.8 Astro-Tachar, 200/3.5 Astro-Telastan, 250/2 Gauss Tachar, 300/5 Astro-Fernbild, 400/5 Astro-Fernbild, 500/5 Astro-Fernbild, 500/4.5 Astro-Telastan, 640/5 Astro-Fernbild, 800/5 Astro-Fernbild, 1000/6.3 Astro-Fernbild, 2000/11 APO-Telastan, and the 2000/10 Astro-Telastan. All of these were in interchangeable mount s, covering up to 2 1/4. All were expensive lenses. The 2000/11 APO listed at a modest $14,520 in 1978 dollars!! A 1937 Astro-Berlin brochure mentions that "Leica Mount" lenses can be specially ordered from the factory. It does not specify Leica mount reflex housing lenses, rangefinder coupled lenses, or both. Click here for pics of a rangefinder coupled 125/2.3 Astro-Berlin Pan Tachar.